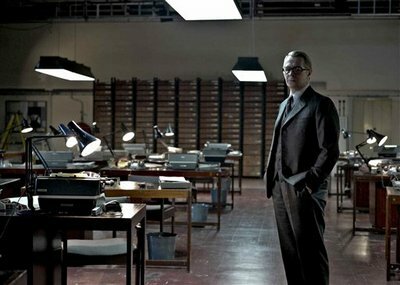 “Tinker, Tailor, Soldier, Spy” is the well-reviewed remake of the classic film based on John Le Carre's thriller of Cold War espionage. The film follows an English spy (Gary Oldman) as he returns to MI-6 under a cloud of suspicion. In the years since he was sacked by the agency, some suspect he’s become an operative for the Soviet Union. The all-star cast also includes John Hurt, Colin Firth, Tom Hardy and Benedict Cumberbatch. David Edelstein of New York Magazine says, “It’s a treat to be back in Le Carre's world, where amid the tangle of plots and counterplots there are moments of lucidity when you sit up and say, ‘I’ve got it now!’” “Tinker, Tailor, Soldier, Spy” opens Friday at the Michigan Theater as well as in area multiplexes. Happy Birthday to the Michigan Theater! Today is the 84th birthday of the Michigan Theater. Opened in 1928 as a silent-era movie palace, it seems only appropriate to celebrate with a special screening of the acclaimed hit of the Cannes Film Festival and, arguably, the most celebrated film of 2011, the silent-era style film “The Artist.”Â It has been nominated for 6 Golden Globes, including Best Picture: Comedy or Musical, Best Director, Best Screenplay, Best Actor: Comedy or Musical, and Best Supporting Actress. Tonight’s special 7 p.m. screening will feature an actual 1920s short silent-era film - Buster Keaton’s “One Week,” presented with live musical accompaniment by Steve Ball (in addition to a featured screening of “The Artist").” “The Artist” will continues its run at the Michigan Theater all week, so if you can’t make it tonight, come on downtown throughout the week to see “The Artist” and wish the Michigan Theater a happy birthday! “The Devil Inside” is a pseudo-documentary surrounding the events of a demonic possession. In 1989, emergency responders received a 911 call from Maria Rossi (Suzan Crowley) confessing that she had brutally killed three people. 20 years later, her daughter Isabella (Fernanda Andrade) seeks to understand the truth about what happened that night. “The Devil Inside” opens Friday at a multiplex near you. The State Theatre’s midnight screenings return with “Anchorman: The Legend Of Ron Burgundy.” Marking the directorial debut of Adam McKay, former head writer for "Saturday Night Live" and founder of the Upright Citizens Brigade. “Anchorman” stars Will Ferrell as Ron Burgundy, San Diego's top-rated news anchorman. When Veronica Corningstone (Christina Applegate), an aspiring newswoman, challenges his male chauvinist world view, Ron explodes to wonderful comic effect. “Anchorman: The Legend Of Ron Burgundy” plays Saturday, Jan. 7 at 11:59 p.m.
Have you seen the new Muppet movie now playing in area multiplexes?Â This Sunday you can see Jim Henson’s lovable and clever puppets in their 1979 screen debut at the Michigan Theater.Â “The Muppet Movie” shows how Jim Henson’s irreverent, irrepressible, and downright irresistible Muppets rose to fame and fortune: with a rainbow, a song . . . and a frog. Featuring Oscar-nominated music and side-splitting appearances by some of the biggest names on the silver screen—including Steve Martin, Mel Brooks, Orson Welles, and more! “The Muppet Movie” plays Sunday, Jan. 8 at 1:30 p.m., and admission is free for kids 12 and under. UMS and the Michigan Theater join forces to bring a high-definition screening of the National Theatre of Great Britain’s production of John Hodge’sÂ (screenwriter of “Trainspotting,” “Shallow Grave,” and “The Beach”) stage production of “The Collaborators.” The play centers on an imaginary encounter between Joseph Stalin and the playwright Mikhail Bulgakov (best known for his novel “The Master and Margarita”). The play stars Alex Jennings (“The Habit of Art”) as Bulgakov and Simon Russell Beale (“London Assurance”) as Stalin. National Theatre Live: “The Collaborators” plays Sunday, Jan. 8 at 4 p.m.
” on Thursday, Jan. 26 at 7:30 p.m. The director, Jamie Travis, will be at the screening, just off the plane from Park City, Utah - home of the Sundance Film Festival.Â Get your tickets today, before they are sold out (the Sundance Film Festival USA screenings the past two years have all sold out). Go to michtheater.org to buy tickets and get more information. A special sing-along presentation of Disney’s “The Little Mermaid” is coming to Ann Arbor Friday, Feb. 17; Sunday, Feb. 19; and Monday, Feb. 20 (a school holiday date). Join Ariel and her undersea companions as they sing hit Alan Menken & Howard Ashman songs like "Part of Your World," "Under the Sea," "Kiss the Girl" and many more. Get your advanced tickets from TicketWeb at the Michigan Theater website Admit it, you know you want to be there! Sun, Jan 8, 2012 : 2:53 a.m.
Fri, Jan 6, 2012 : 2:42 p.m.
Fri, Jan 6, 2012 : 2:58 a.m. I really loved The Artist and so perfect I could enjoy it as the theater celebrates 84 years! Thu, Jan 5, 2012 : 10:34 p.m. I'm definitely looking forward to &quot;Tinker, Tailor, Soldier, Spy&quot;. How will Gary Oldman deal with the ghost of Alec Guiness' portrayal of George Smiley? Thu, Jan 5, 2012 : 5:56 p.m.
Definitely looking for to TTSS. The Michigan Theater offerings have been pretty uniformly great lately - I was seriously impressed by the Descendants in particular and am very glad to have had the chance to see it on the big screen. It's difficult to overstate how valuable a good community movie theater can be! Thu, Jan 5, 2012 : 3:54 p.m. Finally! After I see Tinker Tailor, I'll be able to compile my best of 2011 list. Or do I wait for Shame to come out? Hmmm. . .
Thu, Jan 5, 2012 : 2:46 p.m. I'm looking forward to Tinker, Tailor -- there was an excellent BBC mini-series a while back with Alec Guiness as Smiley. I don't know if they've simplified it for the movie, but the plot of the book is very complex. Knowing a little about the story before you go might help your understanding - but try not to learn the ending! Thu, Jan 5, 2012 : 1:36 p.m. Anchorman is one of the most underrated comedies in the past decade in my opinion. Definitely a movie that has gained a sort of cult-cinema status. I'd love to go see it at midnight @ the Michigan Theater!